It is critically important that decision-makers recognize that the quality of water resources is a reflection of land use decisions. After all, different land uses will introduce different pollutants in stormwater. Careful land use planning can be used to curb the various pollutants that are related to stormwater - harmful bacteria, heavy metals, motor oil, fertilizers and pesticides, nutrients, debris, and sediment. Additionally, flooding is exacerbated by increasing volumes of stormwater generated by increasing amounts of impervious surface. During a storm, rain water that falls on impervious surfaces does not have the opportunity to infiltrate through soils, so instead flows to low points in the landscape. In urbanized areas, this is typically to a stormwater inlet, which then directs the volume of stormwater to a pipe that leads to a ditch, stream, lake, or the beach. This increased volume of runoff all hits the stormwater infrastructure at the same time and often leads to increased flooding problems. So, how do you as a policy-maker start to manage stormwater problems that already existing in your community, while ensuring that these same problems are not repeated for the next generation? First, consider how well your town or county documents critical natural resources that are an important part of your town's quality of life and oftentimes an influence on the economy and property values. Are there measures in place to protect these resources? In the past, stormwater managers and decision-makers have evaluated stormwater on a site-by-site basis. As development continues to grow and our impact on water resources becomes more of a concern, the stormwater manager needs to look at stormwater on a larger scale. Recognize what watersheds exist in your community, and what problems exist in each basin (if any). How can land use planning tools be used to prevent problems downstream, or protect those areas that remain pristine? Land use planning tools include ordinances, zoning, street standards and road designs, site coverage limits, the permit process, critical area designations, fines and mandatory classes for violators, brownfield and grayfield redevelopment, conservation easements, and others. The Center for Watershed Protection's Urban Watersheds series is especially helpful in identifying these tools. 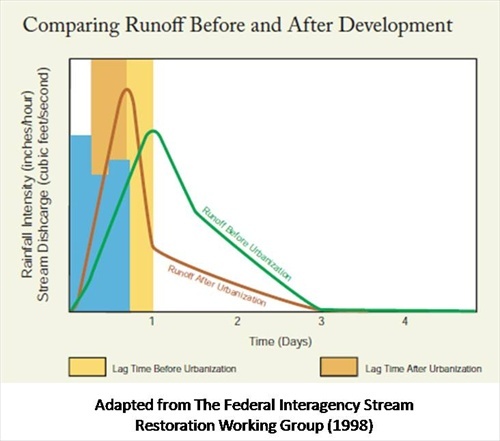 The University of Connecticut's NEMO (Nonpoint Education for Municipal Officials) program also emphasizes preservation of predevelopment hydrology as a stormwater management priority. More information on tools to preserve predevelopment hydrology can be found at http://nemo.uconn.edu/publications/LIDPub.pdf. Stormwater management does not end at the land use planning stage. Long-term maintenance of stormwater infrastructure is critically important to both water quality and flooding concerns. Some researchers have found that catch basin clean-outs can significantly improve water quality. Also, mandatory maintenance of new stormwater best management practices should be ensured so that these new technologies can be successfully employed to reduce stormwater pollution.